WEST Dressed is the social enterprise of WEST Auckland Enterprise Skills and Training located in Henderson CBD, Auckland. WEST Dressed sells pre-loved plus size clothing, sizes 16 – 32 from our shop located at the rear of WEST at 9 Henderson Valley Rd, Henderson. We are open every Friday 10am – 2pm. Proceeds from WEST Dressed fund our Plus Sized Clothing Swap Events, Sewing for Beginners, Slow Cooking on a Budget, Managing your Money and other Becoming Financially Fit workshops, as well as employment support courses in the local community. The proceeds from WEST Dressed enable us to offer many of the WEST courses for free. Please let us know if you would like to donate your plus size clothing to WEST Dressed or our FREE Plus Size Clothing Swap which is held every three months. Phone 837 1471 or email admin@west.org.nz or come and see us at 9 Henderson Valley Road, Henderson for more information. WEST Dressed sells pre-loved plus sized women’s clothing (sizes 16 – 32) and is open Fridays 10am – 2pm and every second Saturday 10am – 12pm (check our WEST Dressed Facebook page for Saturday dates). WEST Dressed is located at 9 Henderson Valley Rd, Henderson. The generous donations we receive from people in our community enable WEST Dressed to offer good quality, plus sized clothing at very affordable set prices ($1.00 to $4.00 per item) AND 100% of the income generated from WEST Dressed enables WEST to run free Becoming Financially Fit courses and workshops that support community economic wellbeing in West Auckland, including Beginner Sewing Classes, Slow Cooking Classes, Clothing Swaps, Employment Support Programmes and much more. If you have any plus size clothing (sizes 16 – 32) you no longer need and would like to donate please contact WEST on 09 8371471 or by emailing admin@west.org.nz. The WEST office at 9 Henderson Valley Rd, Henderson is open for drop offs 9am – 3pm Monday to Friday. Since WEST Dressed opened in August 2018 and we have met many wonderful people, some of whom travel long distances to visit the shop. 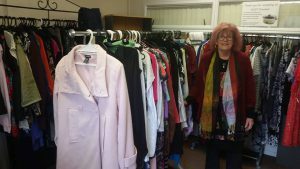 Some come with friends, others alone, but all are greeted by our lovely volunteer Barbara who has an eye for fashion and colours. If you are not sure about an item, the colour or the style Barbara is on hand to give great advice and will even assist you if you would like to ‘re-invent’ your style or try out a new look.